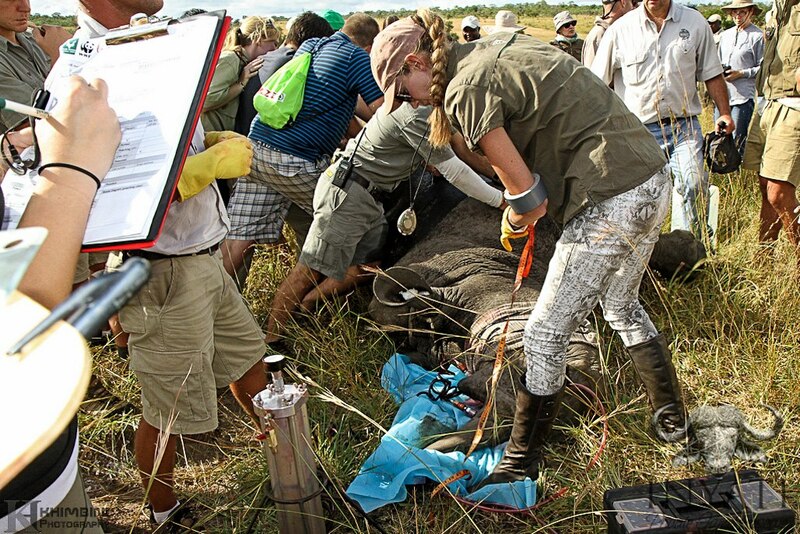 More Rhino being darted to have the horn poisoned. 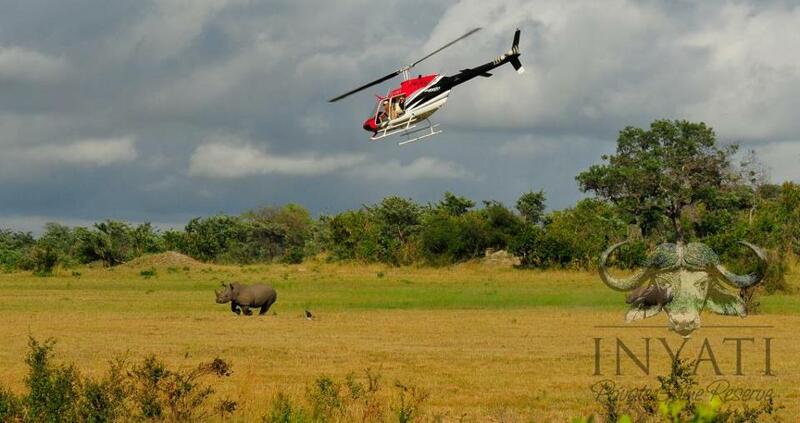 The Sabi Sand is aiming to have all the rhino infused in the next few days. 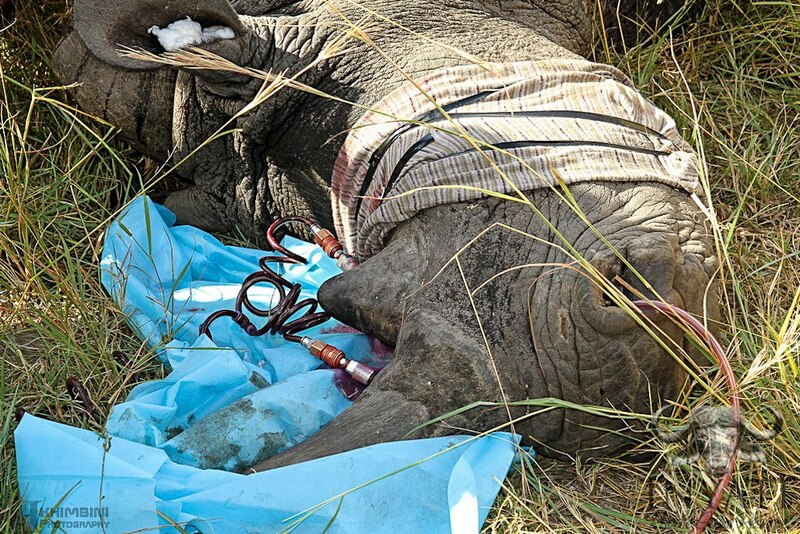 As part of our ongoing effort to combat rhino poaching on the Sabi sand, we are undertaking the horn infusion treatment as pioneered by the Rhino Rescue Project.We view poisoning rhino horn as a valuable intervention to deflect prospective poachers. The horn is treated by infusing it with an indelible dye that contaminates the horn and renders it useless for ornamental – or medicinal use. A full DNA sample is harvested and three matching identification microchips are inserted into the horns and the animal itself. At the owners discretion, the indelible dye can be mixed with with special compound of depot ectoparasiticides (specifically acaricides containing pyrethroids and organophosphates) and a tracking device can also be fitted. Following the poaching on their reserve, Rhino Rescue Project started researching a number of possible solutions to prevent having another rhino poached and in the process, heard about a group of wildlife vets researching the treatment and management of ectoparasites in rhino through the use of depot ectoparasiticides. Much research went into all products readily available on the market for treating livestock, to ensure that firstly, they would have not have a negative effect on the rhino or its horn, and secondly that they would have no impact on other fauna and flora sharing the same ecosystem. Since the Reserve is dependent on tourists as its major source of income, dehorning of animals was not deemed to be a practical solution – especially since dehorned rhinos often still get poached for the base of their horns, and the horns grow back. Furthermore, some research studies have indicated that dehorning can have adverse impacts on the animal’s social structures and breeding patterns. Frequent darting of large mammals, as is required for dehorning to be an effective deterrent, leads to increased health risks and is often the cause of an animal’s life span being shortened substantially. Yes. The Rhino Rescue Project horn treatment methodology is the only legally-recognised treatment option available at present (a full legal opinion is available upon request). What steps have been taken to prevent treated horns being accidently ingested? The fact that the rhino’s in the reserve are treated is widely publicised by means of 200+ signposts around the reserve’s perimeter and, should a treated rhino be killed, the indelible dye is clearly visible inside the horn – a clear indication that the horn had been tampered with. We strongly suggest involving staff in the horn treatment process to assist (with menial tasks) as their involvement ensures that word about the treatment spreads rapidly via the “bush telegraph”. What is the purpose of the dye and how does it work? The dye is bright pink and clearly seen inside a treated horn, regardless of whether the ectoparasiticides have been used, which means that there can be no doubt about whether a horn is treated or not. It is similar to products used in the banking industry and has the added benefit that it is visible on an x-ray scanner. Thus a treated horn, even when ground to a fine powder, cannot be passed through security checkpoints unnoticed and so airport security checkpoints are almost certain to pick up the presence of the dye. The dye cannot be removed in any way and therefore the horn is rendered useless in terms of ornamental use. This contamination should also discourage medicinal use. Furthermore, sniffer dogs have been trained at a professional training facility to track rhino horns containing the dye, even in minuscule quantities. Is the dye animal- and eco-friendly? It is 100% organic and biodegradable (a full fact sheet is available upon request). No, it is not possible to inject into a rhino horn. Rather it is infused into the horn using a patented high-pressure device designed by the wildlife vet who developed and oversees the programme, Dr. Charles van Niekerk. What is the reason for the DNA sample and microchips? To further assist in the ongoing war against poaching, scientists at Onderstepoort have made available a full DNA sampling kit, called RHODIS. Information from the sample is added to the national database of rhino, with the aim of aiding the legal community in securing prosecutions in cases where poached horns are recovered by being able to trace exactly which animal the horn belonged to. The microchips also serve as a means of identification. By law, any rhino that is immobilised for whatever reason, now has to be microchipped. What is the purpose of the tracking device? 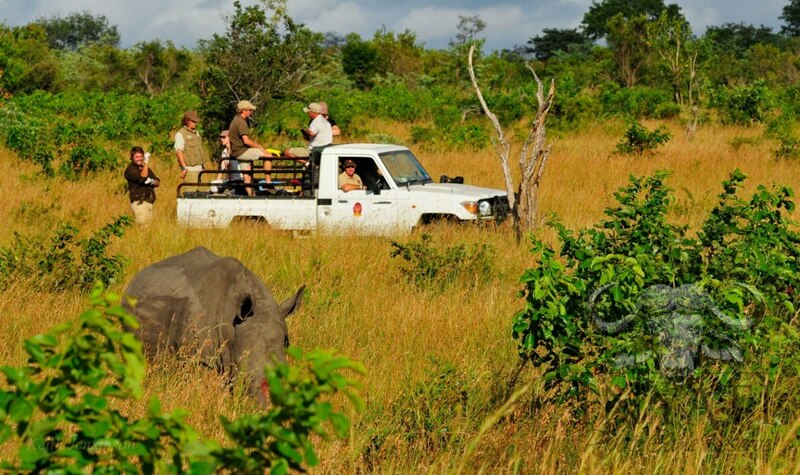 The tracking device allows the real-time tracking and location of the rhino horn using the same technology as vehicle anti-hijacking tracking systems. What are depot ectoparasiticides, acaracides, pyrethroids and organophosphates? Registered depot ectoparasiticides are used to to treat ectoparasitic infestations. • An ectoparasitic infestation is a parasitic disease caused by organisms that live primarily on the surface of the host. • In health, agriculture, and government, the word “organophosphates” refers to a group of insecticides or nerve agents acting on the enzyme acetylcholinesterase. Organophosphate pesticides irreversibly inactivate acetylcholinesterase, which is essential to nerve function in insects, humans, and many other animals. Are any of the products highly specialised and/or illegal? No. They are all freely available over-the-counter products. We do not use any compounds which could be harmful to the animals we treat. Are the products used exactly as directed? Yes, in terms of their registration and classification as per Act 36 of 1947 (Fertilizers, Farm Feeds, Agricultural Remedies and Stock Remedies Act). The products are registered to treat ectoparasites in cattle, horses and sheep, so the only extra-label use is that it is being used on rhino instead. Wikipedia makes mention of the fact that “The veterinarian has a much smaller pharmacopeia available than does the human practitioner. Therefore, drugs are more likely to be used off-label”. The selections of depot ectoparasiticides for inclusion in the treatment compound are registered for use in animals and only Ox-Pecker friendly and Vulture safe products have been used. Ectoparasiticides are not intended for consumption by humans, and are registered as such. Although not lethal in small quantities, they are toxic, and symptoms of accidental ingestion may include, but are not limited to, severe nausea, vomiting and convulsions. What if an animal is injured by a treated horn (ie. in a fight between two rhino)? There are no side-effects. It is the same as a cow with a lesion on its leg being dipped. Are you trying to kill people? No. The compounds are toxic, but non-lethal in small quantities. Research into quantities of rhino horn used for medicinal purposes has indicated that no more than a pinch of ground horn is generally used at one time. What is the reason for treating the horn? Aside from the health benefits to the rhinos, it is the hope of the Rhino Rescue Project that the treatment of the horn will deter the poacher and prevent the rhino being killed in the first place. We are hoping that no treated horn enters the market, as that will mean that programme is successful and the rhino horns are being left intact on the rhino. When can a rhino be treated? Rhinos can be treated at any age as long as they have a horn. Compound quantities are adjusted for all cases. The treatment is fairly inexpensive compared to other alternatives and has a minimal impact on the environment, and no impact on tourism, legitimate trophy hunting activities or the country’s economy in general. The cost includes the professional time (ie. application of the treatment by a vet, taking of DNA sampling and insertion of microchips and tracking devices) as well as the compounds and consumables involved (anaesthetic, treatment compound, dye, DNA kit, microchips, tracking device). As flying time is highly variable, this will be invoiced directly by a helicopter pilot, in cases where one’s services are required. All animals in the initial treatment sample are in excellent health. Since treatment was administered approximately 18 months ago, two cows have given birth to healthy calfs, both of whom are lactating normally. Another cow has fallen pregnant during this time. Moreover, not a single treated animal has been poached since administration of the treatment. The treatment could thus be said to have brought about a 100% decrease in poaching. A year after administration of the treatment, a number of the animlas horns were re-tested to establish distribution of the treatment inside the horn over time and to ensure that the treatment did not find its way into the animal’s system and affect its overall health. Ideally, from a research perspective, a four year growth cycle should elapse before we can say with certainty that the treatment is 100% effective. However, with the current poaching numbers skyrocketing by the day, our fear is that in four years time, this information will be useless, and there won’t be rhinos left to treat. How does the treatment affect legal hunting? We believe that treatment of horns could slot neatly into the trophy hunting trade. If Government would endorse an initiative whereby only rhinos with treated horns may be hunted, it can be ensured that these animals are no longer valued solely for their horns. Reputable hunting farms whose business is true trophy hunting should, in principal, easily reconcile themselves with having horns treated since the horns are not to be removed from the rhino anyway. Why should professional hunters support treatment? Unscrupulous game farmers have managed to trade in horns unchecked, under the guise of legal hunting, and have thus been feeding the demand from the virtually insatiable market. Only those individuals who are interested more in the horn and less in a trophy could possibly have objections to having horns treated. How long does the treatment remain effective? The Rhino Rescue Project horn treatment should remain effective for approximately three to four years (a full horn growth cycle), after which re-administration would be required. What are the long-term effects of the treatment? Since all the products used are biodegradable and eco-friendly, there are no long-term effects on the environment. The treatment “grows” out with the horn and so poses no long-term effect and, if a treated animal dies of natural causes, retrieval and registration of the horn is a legal requirement. Is the treatment programmed intended to be used as a long-term solution? It is our hope that by the time the treatment needs to be reapplied, a more sustainable solution would have been found rendering re-administration unnecessary. We see the treatment purely as a means to “buy time” while a long-term solution is being researched. No long-term solution, whether it be legalisation of trade or otherwise, is likely to be implemented within the next four years. Therefore, a rhino horn treated today for the purposes of keeping the animal alive, can easily be sold, should the animal’s owner desire to do so after the four year growth cycle has elapsed and the horn is once again free of any compounds. What are the overall benefits of including the ectoparasiticides in to the treatment? The inclusion of ectoparasiticides in to the treatment assists towards improved health of the animals. Wild animals are not normally be treated against parasites – we believe strongly in nature being allowed to run its course and human intervention being kept to a minimum – however, the inclusion in to the treatment potentially neutralises a dual threat (both poaching and parasites). This treatment benefits the rhino owner, does not harm the environment, does not harm other living organisms, has no adverse effects on tourism or the economy, is cost-effective, legal and can be completed in under an hour. In other words, it is a minimally-invasive procedure intended to uphold the status quo with regard to the trade in animal parts. Moreover, insurance brokers and underwriters have come onboard with the treatment and offer insurance for the procedure itself. They are also in the process of exploring the option of expanding to include insurance cover against poaching for animals with treated horns.